Here’s something that might be handy as a Xmas stocking-filler! Over the years I have collected a variety of books on cycling for transport and urban cycle commuting. Invariably they have been written for overseas audiences; the only “NZ Edition” biking book I ever got was basically a British book with a sticker about our helmet law slapped on it. So it is pleasing to see the recent attention to utility cycling by local publishers, including this latest offering from Awa Press. Alastair Smith has been a stalwart of cycling advocacy in Wellington for many years, so he is well placed to write on how to get around your town by bike. 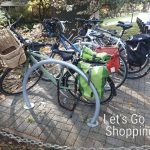 This compact guidebook is an easy read covering all the essentials, from choosing a bike and gear, safe riding skills, and basic bike maintenance. There’s also useful advice on little details like dealing with crashes, cycling with children, and using public transport with your bike. Lots of good photos and diagrams help to illustrate the points mentioned; there’s some particularly useful ones to explain on-road cycling skills. If you’re not yet convinced, Alastair also provides a comprehensive list of reasons why cycling is good for you and society, including a thorough list of references on health benefits. Not surprisingly, many of the examples and pictures are rather Wellington-centric, but there is a very useful summary of cycle routes in 16 of our major urban centres and weblinks to find out more. Rather oddly though, our 5th largest urban area Tauranga isn’t included, yet the likes of little ol’ Oamaru is? 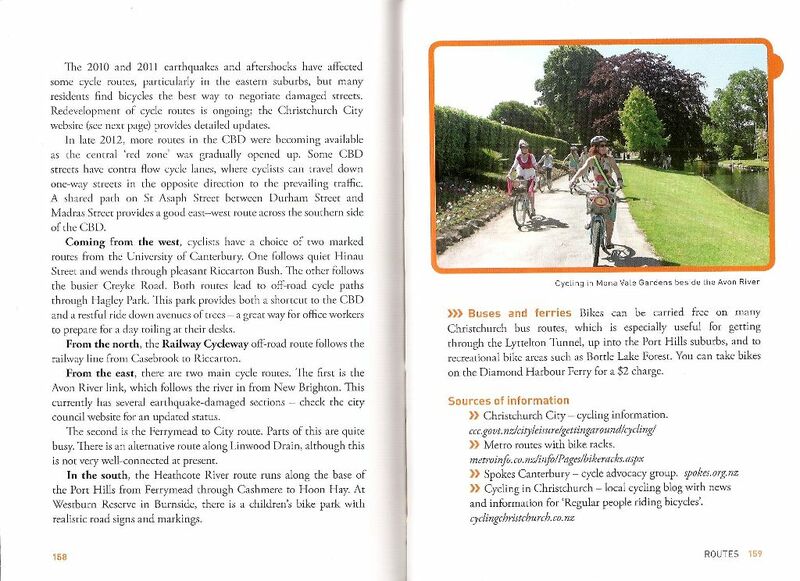 Christchurch gets a generous three pages about some of our key facilities – there’s even a plug for the “Cycling in Chch” website! Alastair also puts his advocate hat on at the end to explain how the reader can get involved more in making everyday cycling better in New Zealand. And there is a handy list of other books and websites (many from NZ) to learn more. 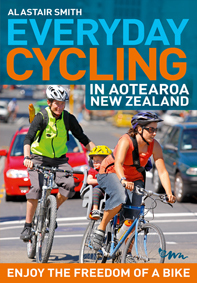 All in all, this is a very useful addition to the bookshelf of any New Zealander who rides around their town, or who is thinking about doing so. As the title page says, enjoy the freedom of a bike! Next Next post: 100 Blog Posts: What should the next 100 cover?